It doesn’t take a lot of code to create a UILocalNotification but when you have multiple of them and you’re doing a lot of calendar math and things start getting hairy. To demystify that experience I created a project with a UITableViewController that prints out all of the current UILocalNotifications. I’ve had a bad time trying to get Jewelry Box running on Mountain Lion. I simply didn’t know how to edit my current $PATH. I quickly changed the order and then after a trip to thew ‘brew doctor’ everything seems fine and now I’ve got ruby 2.0.0! I really love UIView animations. They are so simple and elegant. This little chain I will make will fade in a UIView (or descendant) from the left, wait a moment, then fade out to the left. In general you can animate all of these properties: frame,bounds,center,transform,alpha,backgroundColor,and contentStretch in a UIView animation block. 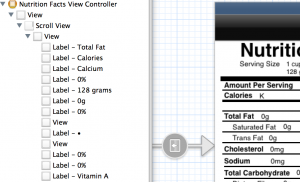 For this example I created a single view application and put a UIImageView in the middle of the screen. UIImageView is a direct descendant of UIView so it is perfect for this exercise. Although it is non-standard. I needed to match pixel-perfect to a design, so I created this. On a UITableView it is called ‘Disclosure Indicator’ as opposed to the one available from UIButton which is ‘Detail Disclosure’. It is 50×80 with a transparent background. Use this image on top of a button or UIImageView. Resize it to whatever size you’d like your button to be. Apple recommends a hit target of no less than 40×40. I sized it to 10×16 in my storyboard, but I am using a transparent button overlay so the size doesn’t matter. 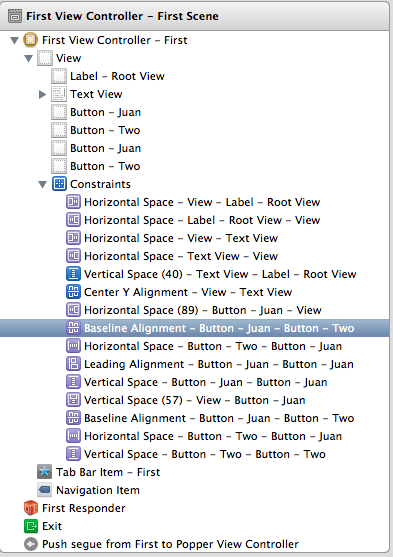 Usually even if you drop in a UIScrollView, put a UIView into that and align them correctly it still does not work. Why? It’s UIScrollView.contentSize. 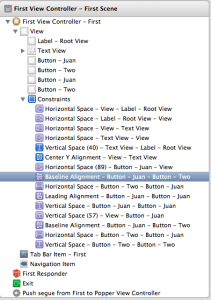 Now we can easily do this in code, but it is also easily accomplished in Interface Builder. The first thing I’ve done is drop in a UIScrollView, pop a UIView inside of it and then populate my controls into said UIView. We can verify this by looking at the hierarchal view. NSPredicate is the simplest way to do it. There is much more to NSPredicate. I used exact matching, but matching with BEGINSWITH, CONTAINS, ENDSWITH, and LIKE. In some examples you’ll also see [c] or [cd] next to these keywords. The ‘c’ means it searches case insensitively and the ‘d’ means that an ‘o’ with an umlaut is still just an ‘o’. I am trying to get a custom day of the week format like this: Su, M, T, W, Th, F, S.
I’d really like to be able to compare numbers and get 0-6 instead of the full name(Wednesday) or the 3 letter day (Wed). I found this great resource for the NSDateFormatter codes. It turns out that ‘E’ is the 3 letter name and just ‘e’ is the number! The problem I found was that ‘e’ was not zero based, so I had to put a pad into my NSArray that gives my custom weekday string. Walking through the code I created a date named ‘now’. Then I created an NSDateFormatter followed by an NSArray of the custom daysOfWeek. I’m using Objective-C literals so I don’t need to end in ‘nil’. I also added a string for the zero element as this output is not zero based so it will never be zero, but it will go from 1-7 for Sunday-Saturday. I then use the format string of @”e” to get just that number and in the next line I create an NSInteger and it’s not a pointer because NSIntegers is basically just a C int. The NSDateFormatter will return a string no matter what and since I know I’m getting a number I just use the NSString ‘integerValue’ to cast and it returns an NSUInteger. NSUInteger is an ‘unsigned int’ variable and NSInteger is just an ‘int’. I could have used either but these numbers will always be small so an NSInteger works just fine. They all declare that it is a pointer to an NSString. There is no difference except readability. I prefer the first version because it shows the type and it is clear that the variable is a pointer.